Another month. More cash, around $300 was deployed on more stock. There was less this month than other months because February is a light month since I don't hold many companies that pay in Feb. Below are my payouts for February 2017. 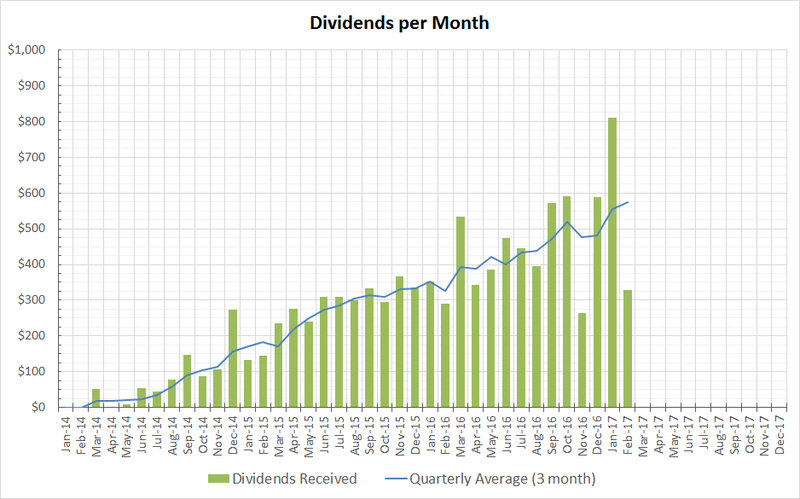 For March I am expecting $630 in dividends, and April I am expecting a large $800 check in dividends. Good stuff YD. That $300 is still a solid total considering that February is a slower paying month and it looks like about a $50 increase from November. I'm really hoping to get a chance to add more companies that pay in January and February but most of those companies are overvalued right now but I have a few on my radar should they ever come down in price. All the best in March. Quarterly average creeping up which is the number I look at, big growth from the previous quarter even though you had a "slow February"
That's a nice sum for a 'light' month. Always happy to see quiet a few names in common paying us last month too. Keep up the good work. Your income trend is moving ever higher! An $800 April sounds very nice. That will be awesome. I am very a little bit from getting one of them. Good luck in getting it.